LinkedIn members who are dedicated regular users all agree the platform delivers substantial benefits. But what would a deeper probe of experiences reveal? What are the tools and behaviours for great LinkedIn results? 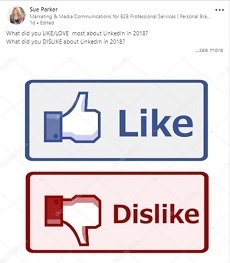 Asking members what they really liked and disliked about LinkedIn were important questions. Answers would shine a balanced light on the activities, tools, systems and behaviours from both members and LinkedIn to impact user experiences and success going forward. In total 220 participants shared their views. Age, gender, location, industry, seniority and professions were diverse. It’s worth noting that for some, LinkedIn is their primary marketing and sales tool, for others it’s part of a broader strategy. Many remarked that they didn’t just like the platform but loved it. Several expressed a love-hate relationship and others a sense of it being a necessary evil. Follow are lists of common responses, tools and functions identified and a few takeways. There were a wide range of new functions and tools introduced in 2018. Some garnered mixed opinions but overall the introduction of most were welcome and robustly integrated. Voice messaging (on mobile) seemed to be embraced more by those who identified as extrovert. This was used by many as a key point of difference in their message strategy and is worth pursuing further from feedback. LinkedIn is the most coveted platform for business development and professional relationships. There are no signs of this abating any time soon. Non personalised connection requests & generic automated 3rd party plug in invitations. Narcissistic, ego driven ‘look at me’ posts. No pre-warning of major profile and platform changes and upgrades. LinkedIn to review how they apportion equal algorithm weight to all content forms: videos, podcasts, posts, document shares and articles. Need to classify content based on quality not format as content preferences are not linear. LinkedIn is a relationship platform. Generic spray and pray invitations and blatant heavy sales pitches just do not work. Following popular rhetoric without critical analysis isn’t advised. For example don’t put up a video just because you think you should. Quality and value-add on all forms of content is first and foremost in any curation decision. Ensure your profile is inspiring, detailed and complete. Put yourself in the reader’s shoes- would you contact you? Add a video messaging tool. Upgrade of recommendations and skills sections. It’s clear that both members and LinkedIn contribute to the overall user experience, albeit from different angles and responsibilities. There is no utopian tool or digital platform in business that is 100%. But LinkedIn is the clear champion for growth and networking transformation. Businesses who embrace LinkedIn in 2019 will maximise abundant opportunities. Those who don’t will definitely be leaving money on the table.